When you're juggling your schedule, it can be hard to squeeze time in for physical activity. Strength training at least two to three times per week can help you build and maintain muscle, which is associated with a faster metabolism. You can use this one-hour program designed by Jennifer Ricupero, Green Mountain at Fox Run's fitness manager, to get your total body strength training. Use either free weights or SPRI-tubes. SPRI-tubes are great for travelers, since they fit into your suitcase. Even if you're not on the road, switching between the two can add variety to your regular routine. "Using SPRI-tubes for strength training also kicks it up a notch because they work on strength and endurance throughout each muscle's range of motion," says Ricupero. Equipment: A mat, chair or FitBall, low/high weights or SPRI-tubes for upper body. Need equipment? Order online from our Healthy Lifestyle Shop. Warm up and stretch before training. Stretch the muscle group you worked after each exercise set. Change your resistance with SPRI-tubes by spreading feet further apart or go to a higher resistance color. 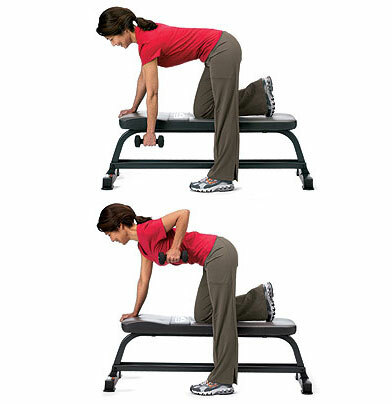 Keep a rhythmic count for all strength moves using a 3-4 count up and down for full range of motion. Breathe on the exertion phase. Check your form. Improper form can lead to injury. Congratulate yourself for completing a total body strength workout. You just increased your lean muscle mass! Photo by ggvic via flickr. Great ideas! Strength training is key for losing weight/maintaining health; I've even used backpacks when I didn't have dumbbells handy.